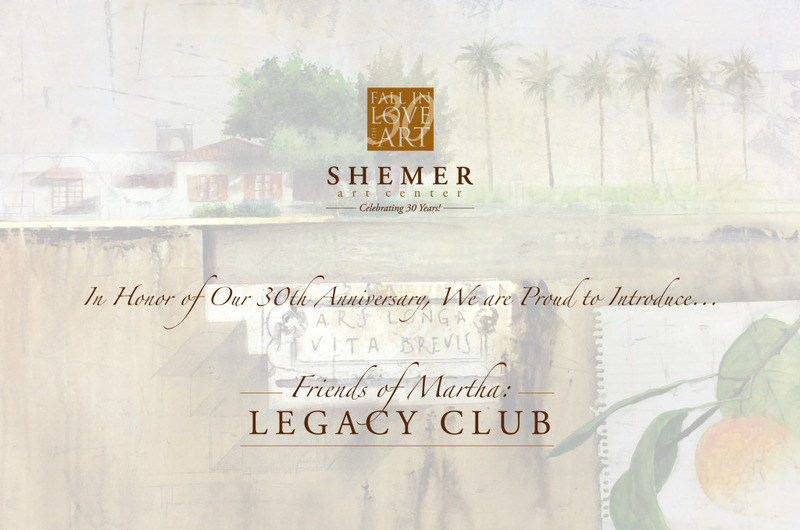 Shemer Unveils 30th Anniversary Portfolio! The Shemer Art Center is celebrating its 30th Anniversary! Friends of Martha Legacy Club. to ensure her legacy continues. A Lasting Tribute . . . Since 1984, the Shemer Art Center & Museum has been proud to serve as a lasting tribute to a woman who devoted her life to improving the quality of life for her fellow Phoenicians and all Arizonans. Her gift has become for its visitors a place to regroup and renew their spirits, creativity, & imagination. Points of Pride for the City of Phoenix. Born April 19, 1919, in Ames, Iowa, Martha Shemer was the youngest child of Dr. John M. Evvard and his wife, Mattie. In 1933, the family moved to Phoenix where upon graduation from high school in 1937, she married Jack Shemer and raised a family of two boys. Throughout their marriage Martha bought and sold real estate. When she first saw the historic home in Arcadia, she proclaimed “someone needs to save this beautiful, historic home and grounds.” Martha Shemer purchased and donated the three-acre lot and historic 1919 home, to the City of Phoenix. She had two dreams: to preserve the property and to provide an arts education facility for the citizens of Arizona. In 1984, the City dedicated the facility as the Shemer Art Center & Museum. Arizona Artist Donates Artwork . . .
Arizona artist, Agustin Vargas has graciously donated his artwork for 5 high-quality giclée prints of historic sites in Phoenix including the Shemer Art Center, Luhrs Tower, Brophy Chapel, Westward Ho, and the Orpheum Theatre. These high-quality giclées, that are signed and hand-numbered by the artist, limited to an edition of 30, and printed on archival paper will be our gift to you, as an exclusive Friends of Martha Legacy Club member! Your new membership is also tax-deductible and includes free admission to all Shemer Art Center events in 2015!